Rockingham Dragway owner Steve Earwood bid farewell Wednesday to one of the most successful events in his track’s long history, citing changes in both the marketplace and the series itself as reasons for his decision to amicably end an six-year relationship with the American Drag Racing League. The series of Dragstock events contested at Rockingham from 2006 through the current campaign helped establish the ADRL’s credibility as a major player in straight-line racing. The inaugural event in 2006 resulted in a one-day attendance record at The Rock that caused the entire sport to take notice of the upstart ADRL. However, with all that success came a change in philosophy that saw the ADRL focus more of its attention on big city markets like Dallas, Houston and Cleveland. Moreover, the ADRL business model, in which tickets are made available free of charge, had become an economic liability for a track like Rockingham that operates on a narrower margin than some others. 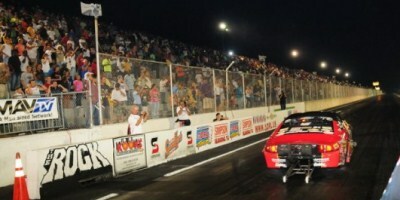 “It’s a great series and a great show,” Earwood said, “and it was a perfect fit for our racetrack at the start. We had six great years but, in a changing market, we’ve survived only by recognizing trends among our racers, sponsors and fans and they’ve indicated to us that it’s time to go a different direction. The ADRL season concludes Oct. 21-23 at the Texas Motorplex with the LenMar Motorsports World Finals presented by Summit.